Jessica Daryl Winer's captivation with color reflects the luminous coastal light of her native New York City and Westport, Connecticut. Winer paints colorful scenes of New York, many of which depict the exciting world of the performing arts. Winer's first love is watercolor and her work on canvas reflects this with her unique technique in capturing the feel of watercolor using acrylic. Her work encompasses both small and large-scale paintings, the latter often installed in public spaces, and involving the performing arts. Her work is in the permanent public collections of: The Museum of the City of New York, The New York Public Library at Lincoln Center for the Performing Arts, American Ballet Theatre, Capezio, and Swarthmore College and most recently, the Golisano Chrildren's Museum of Naples and the Polk Museum of Art at Florida Southern College in Lakeland, Florida. Public installations include: Dance Space in the lobby of the Manhattan Movement and Arts Center, west of Lincoln Center; The Sardi's Screens a freestanding mural in Sardi's; Curtain Call an acrylic-on-canvas mural commissioned as the centerpiece of the Times Square Visitors Center in the restored Embassy Theatre. Her public installation of eighteen suspended, kinetic constructions, Dancing on Air was exhibited at the Times Square Visitors Center from 2002-04. Solo exhibitions include: Centennial Trees of Central Park, Michael Schimmel Center for the Arts, Pace University; the Gallery at Lincoln Center; Art Insights Gallery, N.Y., NY; the National Arts Club; the List Gallery, Swarthmore College; the Silo Gallery in Litchfield, Connecticut; and the Westport Artists Gallery. 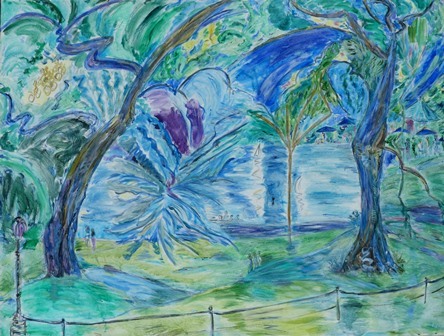 Her paintings also have been exhibited in numerous group shows and benefit auctions, and in the windows of Saks Fifth Avenue. She was commissioned by American Ballet Theatre to create special edition prints. 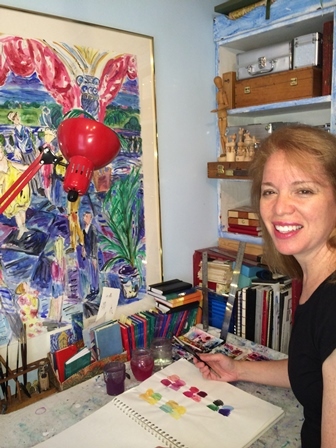 Commissions also include posters and theatrical set design, including projected backdrop drawings; her paintings of opera and jazz subjects have been reproduced by Jazz at Lincoln Center and the Metropolitan Opera, including a Met poster. She is a graduate of Swarthmore College, with studies in Rome (Barbieri Center) and at the National Academy in New York (where she studied with Will Barnet and was awarded the Nechamkin prize in drawing). She was educated at the Rudolf Steiner School. "Shingle Willow Oaks - Sailboat Pond Central Park"